This UHF wireless remote control unit and associated base station set is designed for controlling lights locally when focusing and also offers 'basic system backup'. 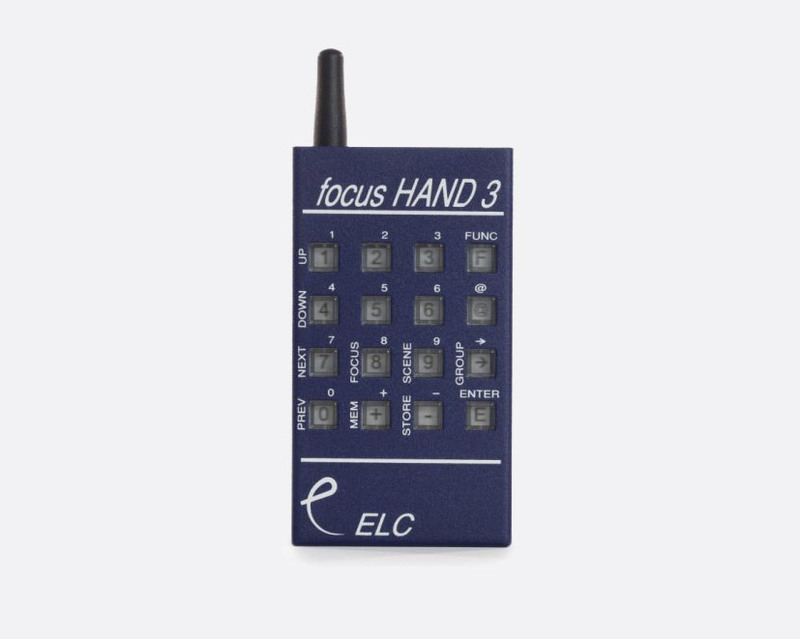 The system comprises a battery-operated handheld controller and an AC mains-powered base station that connects between the DMX output from the lighting desk and the dimmers. The rugged wireless handheld unit provides direct access to any DMX channel or group, 50 recordable cue states and up/down level control. Range: 75m (internal venue) 200m (open space). This has 16 keys, and is used with the HHM3 base station. Power source: 9V 6LR61 (PP3) alkaline battery. Dimensions: 115 x 65 x 20mm. Weight: 0.3kg. Base station with antenna for Focus Hand 3. Power source: 90-240V AC 50/60Hz, captive cable. Dimensions: 200 x 44 x 150mm. Weight: 1.4kg. Optional accessories: RMDT 19 inch rack mounting kit.